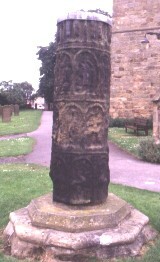 Pillar, east view, dated to early ninth century. The column has four rows of panels running around it. The top register is thought to be Christ and the Apostles. The second row panels are difficult to identify. One panel is thought to be David and the lion, Old Testament, 1 Sam 17:34 (Hawkes). The panel next to this shows two peacocks (Hawkes). The next one has been identified as David dictating psalms (Hawkes). The next panel is Samson, Old Testament, Jud 16:30 (Hawkes). There are three other panels. The fourth row has seven panels of strange beasts.